It&apos;s #MeerkatMonday at Busch Gardens Tampa. 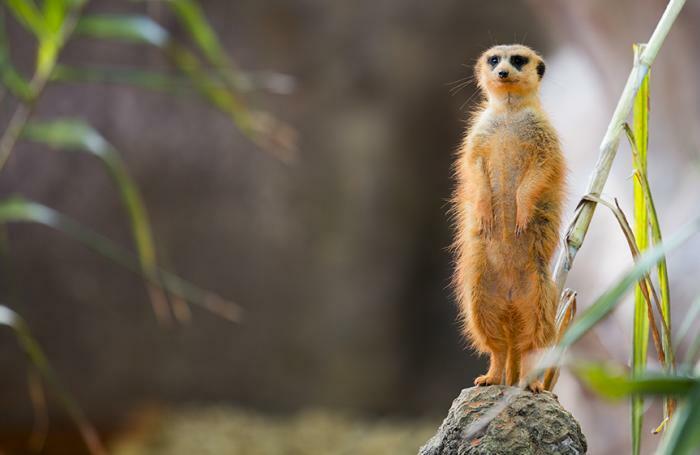 The Tampa Bay theme park and zoo has added the Meerkat Cam to AnimalVision, the collection of cameras Busch Gardens and its sister park, SeaWorld, have trained on the animals in their care. The video feeds are available online 24 hours a day. Together, the SeaWorld and Busch Gardens parks care for one of the largest zoological collections of animals in North America: more than 86,000 animals. Viewers can watch penguins swim at show-off speeds, be charmed by the antics of meerkats, see stingrays glide by so close it feels like you could reach out and touch them, or get some perspective on some of the most ancient animals of the sea, sea turtles. A meerkat is the African version of a prairie dog. Meerkats live in underground colonies and take turns keeping and eye out for predators. They&apos;re quick of foot, sharp of eye and, frankly, a little high strung. The second danger presents itself everybody scampers down the nearest hole. Of course, they burn a lot of energy living on alert like that, so they eat a lot. And they&apos;re not too picky -- bugs, lizards, bird, and fruit are all for the menu. Meerkats aren&apos;t the only closed-circuit stars at Busch Gardens and SeaWorld. AnimalVision lets you spy on penquins, sea turtles and stingrays as well. AnimalVision lets you switch between cameras to check out the habitats from every angle, snap pics of favorite moments and share them with friends and family. You can also download games, pick up fun facts about the animals and learn about the parks’ worldwide conservation efforts and how they can join and make a difference. You can join in the #MeerkatMonday fun on Facebook, Twitter and Instagram.